“That’s some really good Champagne,” said my father-in-law Rev. B aka pawpaw as we sat down for a dinner of crock-pot pork loin, potatoes, and salad prepared for us by Mrs. B aka nanna last night, our first at home from the hospital with Lila Jane (above). “Man, that’s a stinky toot!” were the next words out of his mouth. 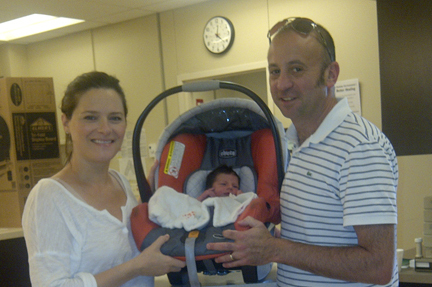 The hospital discharged us just after noon yesterday and as you can imagine, we were eager to get home. Seton Healthcare Family, where Georgia P was born in 2011, took great care of us and the nurses were fantastic. 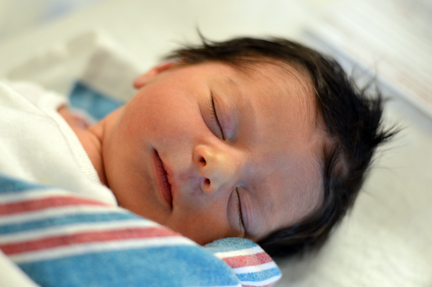 But there’s nothing like the prodding and poking of newborn care to make you long for the comforts of home. Georgia P is doing great as she adjusts to her new family life. 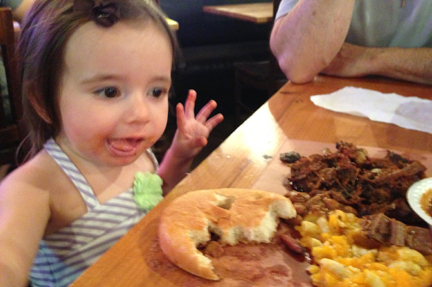 But when watching mommy nurse Lila P became a little too much to bear, pawpaw and I took her out to Stiles Switch BBQ (around the corner from our house) for her favorite meal of chopped beef and macaroni and cheese (Texas style). The folks behind the counter treated her to a little Blue Bell ice cream for dessert. And by the time we took her home for her bath, she was smiling and laughing again. After we bathed and put Georgia P to bed, we paired our homecoming dinner (thanks again, nanna!) with a bottle of Bollinger Special Cuvée that I’d been saving especially for the occasion of celebrating the Parzen family expansion. 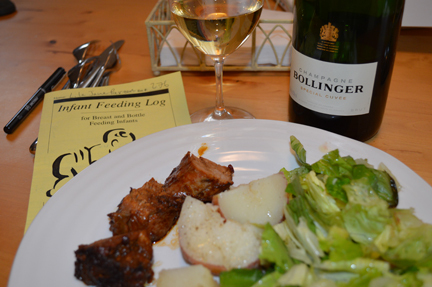 Although we generally reserve Bollinger for special occasions, we nearly always serve it with a meal. It showed beautifully with the salty/sweet soy sauce/honey jus of Mrs. B’s slow-cooked pork loin. Brooklyn Guy, who often reminds us of Champagne’s wonderful food-friendliness, would surely approve. Caring for a newborn is always a challenge. And having a busy toddler in the house adds to the mayhem. But we’ve been so lucky to have Mrs. B and Rev. B (above) here to help us. Beyond Tracie P and me, they’re the only family members that Georgia P feels at home with. They stayed at home with Georgia P while we were at the hospital. 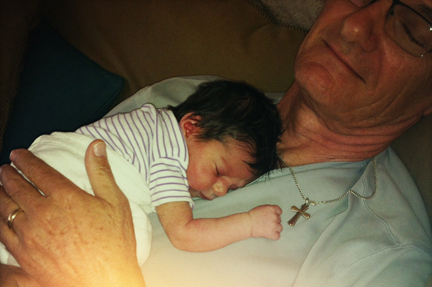 We’re truly blessed to have such loving grandparents in our lives. Today we’re also thinking of and sending lots of Texas love to friends Gabriella and Ryan Opaz who just had their baby a few hours ago in Porto, Portugal. With the memories of our childbirth fresh in our minds, we are with you, Gabriella and Ryan! Mazel tov! It brought to mind a wine that Tracie P and I shared earlier this year, a baby gift from one of my best friends, and a wine that made me question the wisdom of Alfonso’s excellent post today on “The Ultimate Wine,” in other words, as Alfonso put it, That by which you can taste, but that which you can never taste. BTW, if you’ve never heard the song that Céline and I wrote and recorded about Bollinger, here’s a link to listen. It’s from our album Ménagerie (Aeronaut 2009). Perhaps only in Barbaresco have I encountered this wine’s ineffable, sublime balance of power and lightness (the “unbearable lightness,” I like to call it). But where Barbaresco tends toward earth and truffle, great Champagne like this bottling evokes salinity and the sea. Of course, Tracie P and I shared with our sommelier (Mark Sayre, who generously allows us to bring special bottles into Trio at the Four Seasons and who expertly serves them to us). And he, too, was stunned by the elegance, focus, and precision of this nearly perfectly formed bottle. I write nearly because as Alfonso rightly points out in his superb post today, the ultimate wine cannot and does not exist — even if for a brief fleeting instant, Tracie P and I, had a glimpse of it. Thanks again, MAS, for the wine! And buon weekend, yall! Bolly is one of his top picks. Umm, where have I heard that before? We are so lucky to have the support of our family: it’s been a joy to have Rev. and Mrs. B here with us and they’re staying at the house all week to help us get settled. Modesty won’t allow me to reveal a photo of Tracie and Georgia P nursing. But to see Georgia “latching” just minutes after she came into this world was like viewing a living and breathing allegory of maternity. This drawing by Raffaello will have to suffice: words cannot express the emotion we both felt in that precious, precious, unforgettable moment. We’re happy to report that nursing is going great. The staff at the Seton maternity ward was fantastic. Maybe it’s Texas: everyone was so friendly and sweet and all the nurses shared their own personal experiences. Dr. Abikhaled, our ob/gyn, was awesome. And our anesthesiologist — the only male health care provider in the crew — wore cowboy boots. Just had to share these photos snapped by Tracie P the other night when we opened a bottle of 1999 Bollinger Aÿ Rouge Coteaux Champenois La Côte aux Enfants with Coalminer Mark and Annie Oakley the other night at Trio in Austin. Earlier this year, BrooklynGuy did a fantastic post on an amazing tasting of still red wines from Champagne organized by him and Peter Liem in NYC. The bottle had an immensely powerful aura about it. After all, how often do you get to taste a still red wine from Champagne? By our favorite house no less! The wine was excellent, a rich and tannic expression of Pinot Noir that seemed to have mellowed at 12 years out from harvest. But the most thrilling part of the experience was the bottle itself, the mushroom cork, and the metal seal. Note the old-school lip of the bottle (no crown cap here!). The legacy of the canicular 2003 vintage in Europe continues to express itself in fascinating ways (the fallout of the Brunello controversy is probably the ugliest manifestation of the ripples it sent through the wine world). It was one of those challenging vintages when the honest and true made interesting wines nonetheless. While in New York, a colleague gave me a sample bottle of the 2003 by Bollinger, an anomaly for a winery that only vintage dates its Grande Année releases. Tracie P and I are huge fans of Bollinger and drink it every chance we get. This wine was most definitely not in the classic “yeasty” and “toasty” style that is the winery’s signature. I’m not sure what went into the assemblage but this wine was crisper and brighter than the traditional “Special Cuvée” and it drank beautifully. An anomaly and a curiosity from one of our favorite estates, it made for a wonderful and refreshing aperitif at a good friend’s house. Next up: 2002 Joly at Alice’s Restaurant. When our friend Howard isn’t writing screenplays or composing poems to recite at our wedding (glass of Bolly rosé in hand), you can often find him tasting and discussing wine at his (and my) favorite wine bar in LA, where he and I have spent many an eve discussing the epistemological implications in the nuanced semiosis of a bottle of Cascina Francia by Giacomo Conterno (1998 was the last one we opened together). He’s even been known to wine blog now and then, like this wonderful post he did today for a film promotion (click on the images to read his wine and cinema pairings). Chapeau bas, comrade Howard! I will raise a glass to you tonight as I quote my favorite passage from Gramsci! Tracie P had an heirloom martini (above) and I sipped some bourbon with my old bud Billy at the High Ball. After the show, Tracie P and I snuck off to Max’s Wine Dive for a little Bollinger rosé and a chili dog. @TWG I know, I know! Tomorrow the diet begins again! There’s been a lot of chatter lately in the enoblogosphere about the futility of wine blogging. I haven’t really been following it, although I have enjoyed some of the reactions, intellectual here and visceral there. Previously my virtual friend and only recently my real-life friend (after he and 5 other wine bloggers, nearly all of them COMPLETE STRANGERS, joined me in Asti for the Barbera-athon), Thor likes to tease me that I don’t write a wine blog but rather a relationship blog. He’s right. I don’t author a wine blog: I write a blog, a web log (as the etymon reveals) whereby I chronicle my life, my relationships, the music I like, the food I eat, and the wines I enjoy. It just so happens that a lot of my life is centered around wine. I make a living writing about, talking about, teaching, and selling wine. I also happen to be deeply in love, to enjoy music immensely, and to see poetry and inspiration in the world around me — sometimes in a glass of traditional-style Barbera, sometimes in a guitar solo played by a friend. Wine blogging is really about sharing experiences and connecting with like-minded folks. After all, if it weren’t for wine blogging, I would have never met really cool folks (who are now part of the fabric of my life, even though I have very little real-time contact with most of them) like Alfonso, BrooklynGuy, McDuff… not to mention the LOVE OF MY LIFE. antonomasia [ahn-TAH-noh-MAY-zee’ah], the use of a proper name to express a general idea, as in calling an orator a Cicero, a wise judge a Daniel (OED, online edition). Above: An unforgettable bottle of 1996 Billecart-Salmon that I shared last year with Jayne and Jon at Spago in Beverly Hills. We weren’t celebrating anything. But we were being treated by a famous winemaker. In this week’s semiotic treatment of Champagne, we neglected to address one of the most fascinating semiotic implications of the lemma Champagne (at least, one of the most fascinating to me). The term Champagne is a wonderful example of the literary figure antonomasia, from the Greek ἀντί (anti, meaning instead or against) and ὄνομα (onoma, meaning name), whereby a proper name is used to denote a general idea, in this case, sparkling wine. Other examples that immediately come to mind: Xerox and Kleenex. Both are proper names, in fact, brand names, yet both have come to denote generic items, namely, photocopies and tissue paper. Let’s face it: even though we wine professionals and enthusiasts strictly use the term (toponym and proper name) Champagne to denote sparkling wines sourced from the place and appellation, Champagne, 99% of the intelligent lifeforms in the world interpret it as any sparkling wine. In his 1953 editio princeps of With a Jug of Wine, for example, food and wine writer Morrison Wood casually and regularly makes reference to California champagne. Above: A bottle of Initial by Anselme Selosse that Alfonso opened for me and Tracie B last year to celebrate my move to Texas. Perhaps more than any other, Selosse is the most coveted and illustrious brand of Champagne in the U.S. It’s not cheap but it’s worth every penny. 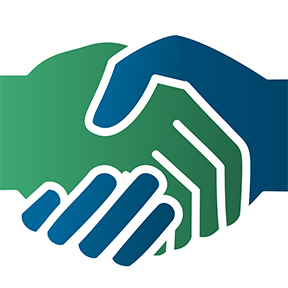 Check out this great post, from earlier this year, by McDuff. Just this weekend, I was reminded of this fact when Melvin C and I visited a Walmart in Orange, Texas in search of some Prosecco for Tracie B, and I was greeted by a “stack” (as we say in the biz) of André California Champagne (“the best selling brand of sparkling wine in the U.S.,” according to the Wiki). Whatever you plan to drink tonight for your New Year’s celebration, Tracie B and I wish you and yours a happy, healthy, and serene 2010. Thanks for all the support and love in 2009! Thanks are due to reader Elaine from Italy who identified the champagne-method Nerello Mascaelese by Murgo (Sicily). According to the Agenzia Giornalistica Italia, when all is said and done, Italians will have spent Euro 2.7 billion on sausage (cotechino and zampone) and Italian sparkling wine (spumante). “Salmon, oysters, and caviar” were no match for the famed boiled sausages of Modena (both delicious, btw). Nor did Champagne, with a “a 66% drop in sales,” rival its Italian counterparts. An early celebration of his upcoming governorship of the Veneto, no doubt. Happy new year, everyone, everywhere!